On a Morse Alpha Sail-Training expedition we were approaching a harbor in typical fashion with a student “Captain of the Day” at the helm. It would be a beautiful anchorage next to one of the quaint fishing villages in Maine, on one of the outermost islands. Everyone was tired. 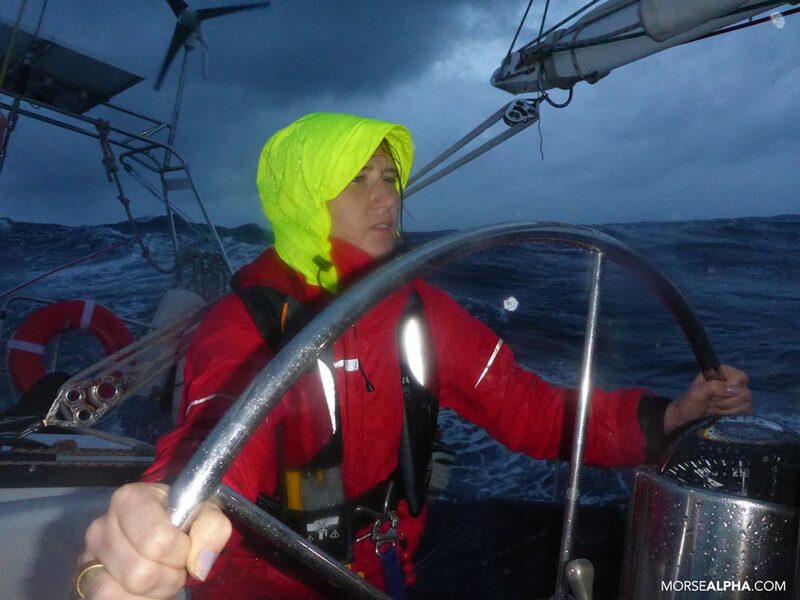 We had just completed our offshore passage, and the watch schedule is tough to adjust to. Last night especially was challenging. The waters were rough and many people got varied and interrupted sleep even during their off-watch. As we approached the island, the students were deliberating where the best anchorage would be, and what is the best approach. 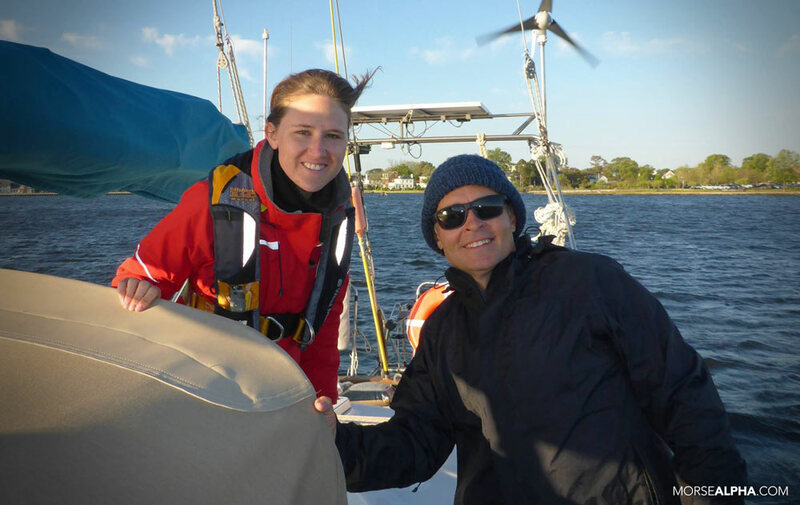 During the latter part of the course, the crew has significant independence in decision-making, and Ben and I only interrupt when we have new lessons or information we haven’t taught yet. By this time, they had anchored many times, they had learned a lot about the tides, currents, the rule of 12th, fetch, lee shores, bottom substrate, wind flow over islands, etc. — everything they needed to know to make a great decision on anchoring — except one thing. 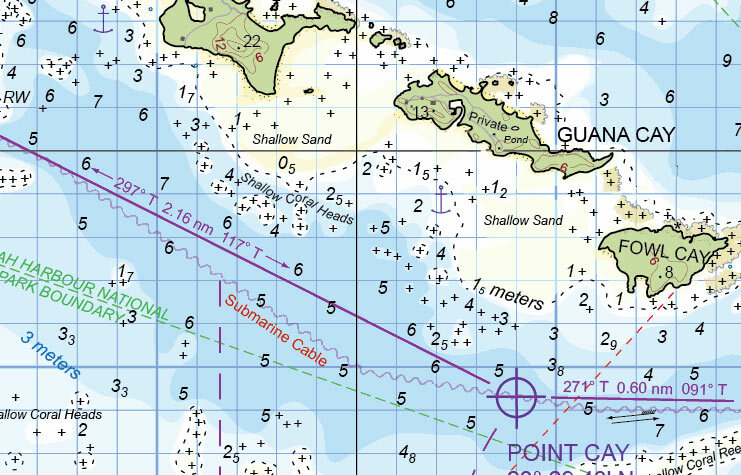 “By the way,” I mentioned, “A bit of local knowledge — I’ve anchored here a dozen times, and there is one uncharted rock to steer clear of,” at which I pointed to its location on the chart. We continued our approach. The sun was rising, but the fog was still rolling in and out, making navigation difficult. 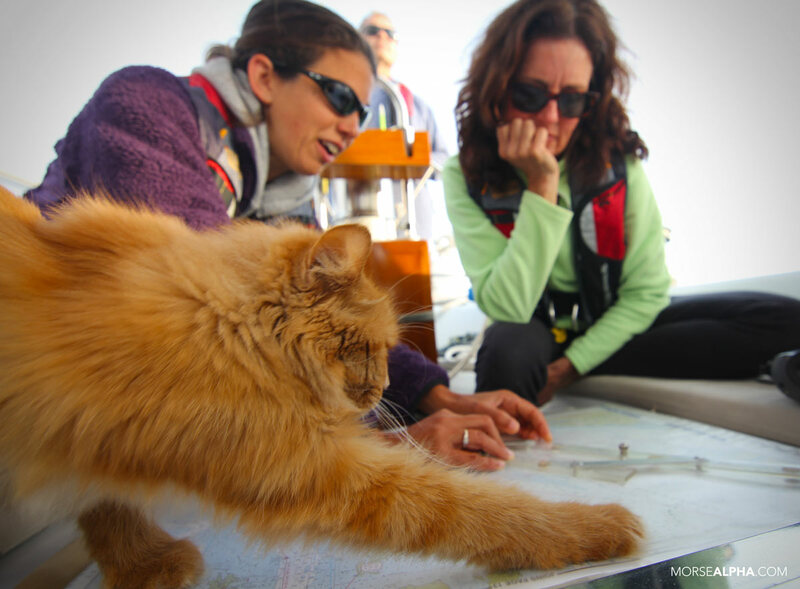 The nav team was dead reckoning, with short bursts of visual navigation of which they took full advantage. This can be typical weather in Maine, and this particular course began with three days of fog, so the crew was quite proficient at DR navigation. There were two entrances to the harbor. One was rocky and wide. The other was clear but narrow. The students debated the merits and challenges of both approaches. They identified their navigation challenges, appropriately understood which approach had the stronger current and which direction it would flow, and came to the conclusion that they would enter via the west entrance. Ben and I were happy with either entrance, so we allowed them to make their own decision. “I would never anchor any place without a guidebook,” said the Captain of the Day. It came as quite a surprise. This was the 6th day of the course, and we hadn’t used the guidebook to anchor at all yet. In all my experience sailing, this is true – especially in the US, Bahamas, and Caribbean Sea. A guidebook is one (or sometimes a few) persons interpretation or experience of their time anchoring in that location. Guidebooks are great for finding out where laundry or groceries are available, but they have never offered me anything more regarding anchoring or approaches than what is indicated on a chart. It it is missing from the chart (like that one uncharted rock) odds are it is missing from the guidebook as well. There are always exceptions. But it is rare, so lets talk about what I really mean: For example, some guidebooks say “good holding.” What does “good holding” mean anyway? For who? When? How do they know? Did they test the holding with 5 different types of anchors, in gusty, shifty, and wicked strong winds or swell from all directions? Likely not considering they have to write about dozens of anchorages in limited time. Guidebooks don’t pay much. I should know – I wrote for one. Other features such as moorings, boats, channels, ferry schedules, etc. In the Bahamas there have been several instances where we entered an area and wondered why people were anchoring on one side of the harbor, when all conditions indicated that the opposite side would be best. White caps breaking beneath their bows, lee shore less than a hundred yards away – still, the boats congregated in that area. It happened often enough that we started double-checking the chart and noticed that every time the boats were congregating where the “recommended anchorage” symbol was. But a word of caution – the chart and guidebook do not know today’s weather, what type of anchor you have, or most of the other factors that effect an anchorage. Use your own judgement. It is often better than the limited ability of a guidebook to make a decision for you in an environment as dynamic as the coast. 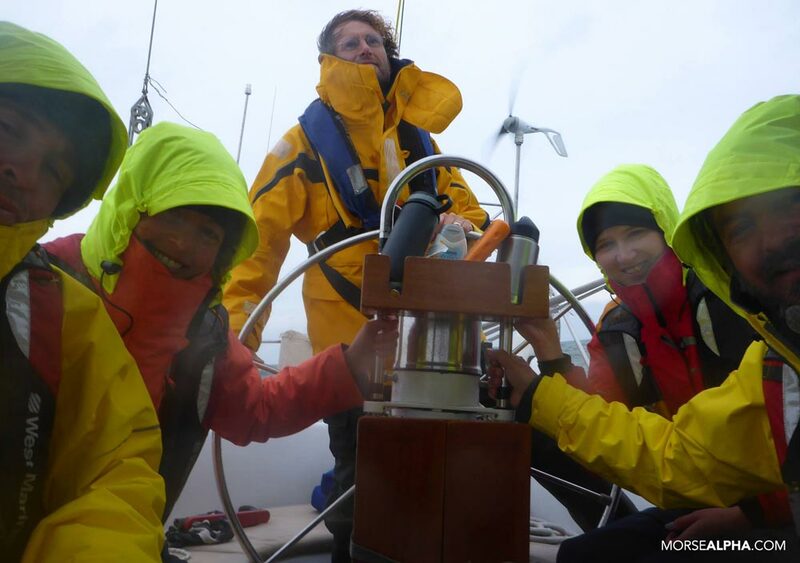 So, back on our Morse-Alpha Sail-Training expedition – when our crew reviewed the guidebook, the information they gleaned matched their original conclusions exactly (and it didn’t mention that uncharted rock!). But our even knew more, because they understood holistically all the conditions that make anchoring a dynamic and ever-changing puzzle. A crew well-trained. An anchorage successful. We are now bound for Maine for another great season in our favorite sail-training and cruising grounds. 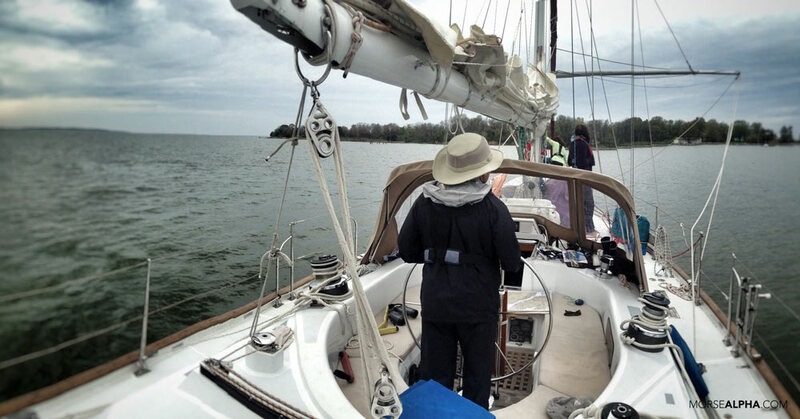 We just completed a 12-day expedition with an awesome crew from The Bahamas to Annapolis. Look at those smiles! Our courses are nearly full for our 2018 season. But there are still a few spaces available. Join an expedition today! Great article, Teresa. Very informative. As a person who has written a guidebook, I endorse your encouragement to learn how to anchor properly (holistically) and not just follow the guidebook or recommended anchorages on the charts. I see cruisers pass up great anchorages all the time, simply because they aren’t in a guide book. Really, this depends on where you’re cruising. Having spent the last 3 seasons cruising mexico’s west coast and sea of Cortez, I would always refer (avidly) to recent cruising guides, as the charts available are in many cases based on surveys over 100 years old, and contain many features that do not exist in the real world, or do not show hazards or features that are indeed present in the real world and are not represented on available charts. In areas where charts are adequate, this is good advice, in areas where charts are poor, not so much. Once you sail out of areas covered by first world charting practices and active hydrographic services, the value of guidebooks, other cruisers advice, and crowd sourced data (like the community layer in Navionics charts) increases in value exponentially. Great post, really like the structure of your course and getting students to think through the situations. It will make them more cautious when they are on their own and not follow the flock. It’s the symbol for the letter “A” in Morse code, of course! Great post, and exactly our experience of anchoring in Maine and New England. Guides are great, but no substitute for good charts and a well trained crew. We’ve found that many of the guide books steer people away from perfectly good anchorages because they have “poor holding.” In our estimation, they experienced poor holding because they had the wrong anchors. But I have to agree with Rob. In Ireland, where the charts are based on datum from the 1800s, the ICC cruising guides and sailing directions have a wealth of information collected by hundreds if not thousands of sailors and constantly verified and updated. They are the most up-to-date source of navigational information available. We don’t have many navaids in the West, so every bit of information can make the difference between a good night and disaster. WOW! Just ran across your youtube vid, I am glad for you as well as glad for me in that I am deciding to do or not to do! I own most of my house, but considering to sell it and get a cutter rig, a bit larger but not by much, I would like to bring onboard my wood working tools, that I may be able to moor up and do some woodworking at some marina, but don’t know if a couple of my pieces would fit through the hach? I am considering a boat of perhaps 38/40 ft, that way there is storage for equipment etc., I also must wonder about the back issues i have, if I could do such a thing as sail again, (did a hitch in the Navy, ..